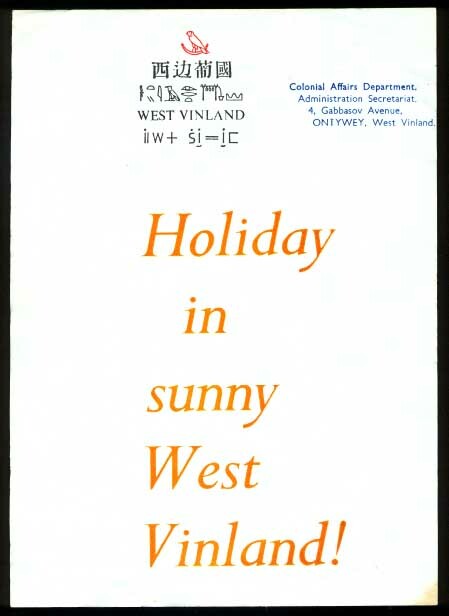 Colony of West Vinland: 1990, Provisional series. 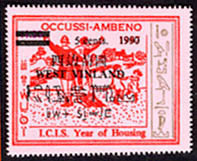 The south-western portion of New Vinland was given to Occussi-Ambeno in 1990, and proclaimed the imperial colony of West Vinland. Colonists flooded in to the country to develop the coal and oil reserves, and to build ports, hydro-electric power station, and a railway network. Post Offices were opened in the towns of Ontywey (the colonial capital and main port) and Berenku. The Berenku Post Office uses an octagonal datestamp. 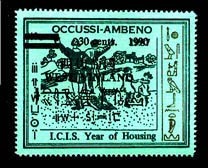 The first stamps issued were these Occussi-Ambeno stamps suitably overprinted. 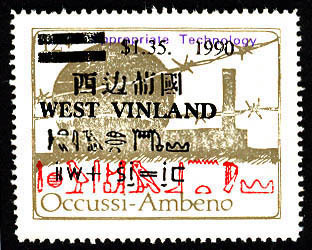 As the Colony has four official languages, the stamps were attempting to satisfy everyone by including the colony name in all four scripts. 1990 (29th November.) - Provisional series. 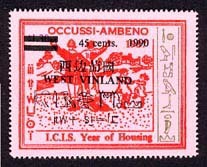 Stamps of Occussi-Ambeno overprinted "West Vinland" in the four official languages, Chinese, English, Egyptian hieroglyphics, and Occussian, plus the year and surcharged with a new value, in black, by the Occussi-Ambeno Government Printing Office (K.D.P.N. ), Baleksetung. Perf 12. View a tourism poster published by the Colonial Affairs Department.